Civility is beauty of behaviour. It requires for its perfection patience, self-control, and an environment of leisure. For genuine courtesy is a creation, like pictures, like music. It is a harmonious blending of voice, gesture and movement, words and action, in which generosity of conduct is expressed. It reveals the man himself and has no ulterior purpose. Our needs are always in a hurry. They rush and hustle, they are rude and unceremonious; they have no surplus of leisure, no patience for anything else but fulfilment of purpose. We frequently see in our country at the present day men utilising empty kerosene cans for carrying water. These cans are emblems of discourtesy; they are curt and abrupt, they have not the least shame for their unmannerliness, they do not care to be ever so slightly more than useful. The instruments of our necessity assert that we must have food, shelter, clothes, comforts and convenience. And yet men spend an immense amount of their time and resources in contradicting this assertion, to prove that they are not a mere living catalogue of endless wants; that there is in them an ideal of perfection, a sense of unity, which is a harmony between parts and a harmony with surroundings. The quality of the infinite is not the magnitude of extension, it is in the Advaitam, the mystery of Unity. Facts occupy endless time and space; but the truth comprehending them all has no dimension; it is One. Wherever our heart touches the One, in the small or the big, it finds the touch of the infinite. I was speaking to some one of the joy we have in our personality. 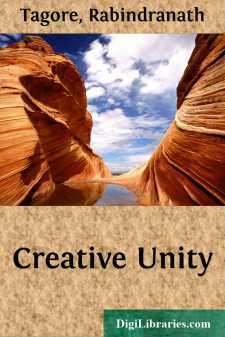 I said it was because we were made conscious by it of a spirit of unity within ourselves. He answered that he had no such feeling of joy about himself, but I was sure he exaggerated. In all probability he had been suffering from some break of harmony between his surroundings and the spirit of unity within him, proving all the more strongly its truth. The meaning of health comes home to us with painful force when disease disturbs it; since health expresses the unity of the vital functions and is accordingly joyful. Life's tragedies occur, not to demonstrate their own reality, but to reveal that eternal principle of joy in life, to which they gave a rude shaking. It is the object of this Oneness in us to realise its infinity by perfect union of love with others. All obstacles to this union create misery, giving rise to the baser passions that are expressions of finitude, of that separateness which is negative and therefore máyá. The joy of unity within ourselves, seeking expression, becomes creative; whereas our desire for the fulfilment of our needs is constructive. The water vessel, taken as a vessel only, raises the question, "Why does it exist at all?" Through its fitness of construction, it offers the apology for its existence. But where it is a work of beauty it has no question to answer; it has nothing to do, but to be. It reveals in its form a unity to which all that seems various in it is so related that, in a mysterious manner, it strikes sympathetic chords to the music of unity in our own being.